Border officials: Some passengers arriving into the country "did not come for innocent purposes"
Tel Aviv (CNN) -- Israeli officials have detained dozens of people traveling to Tel Aviv as part of an organized pro-Palestinian protest, a police spokesman said Friday. At least two of the travelers, both American women, were sent back to their departure cities, and another 200 would-be protesters were not allowed to bound flights from Paris to Ben Gurion airport, Israeli police spokesman Micky Rosenfeld said. Air France said it had been ordered by Israel to refuse boarding to the passengers, who were planning to travel to Israel as part of the group Welcome to Palestine to protest Israeli border policies. "All airports are following the same rules, we are all in the same position," the spokesman said. "The decision to authorize access in to a country is made by the country's authorities, airlines cannot interfere." 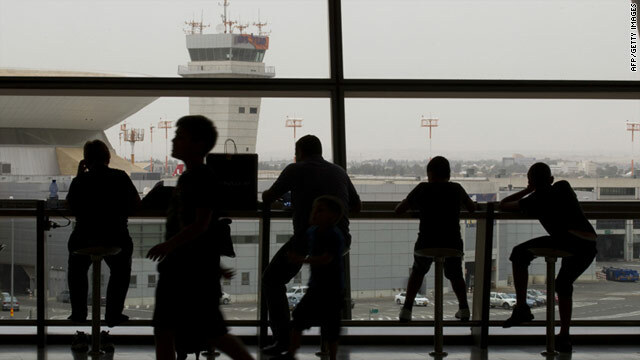 At Ben Gurion, two flights from Europe had been diverted from the international terminal to an adjacent one so that security officials could carry out "more intensive security screening," Rosenfeld told CNN. Security officials detained 32 passengers for questioning, he said. A number of left-wing Israeli protesters were detained in the airport's arrivals area and two Americans were returned to Athens, where their flight had originated, Rosenfeld said. It was unclear if any other passengers had been put on planes out of the country. Oded Ben Hur, an official with the Israeli foreign ministry, said border officials knew that some of the arriving passengers "did not come for innocent purposes but was no reason to refuse their entry. Only those meeting undisclosed criteria were being denied entry, he said. The plan for hundreds of pro-Palestinian activists to travel to the Israeli occupied West Bank via Ben Gurion airport has been dubbed the "aerial flotilla" by local media. It received high-level attention from the Israeli government, which in recent weeks has dealt with a series of high-profile border disturbances. Activists are trying to draw attention to what they say are prejudicial Israeli border policies that require many international visitors coming to Palestinian areas to lie about their destinations. Israel controls all border crossings into the Palestinian West Bank and does not allow Palestinians to operate an airport for security reasons. "The idea was for them to come in and say, 'We are going to Palestine,' to change the discourse and what is required usually from a foreigner coming to Palestine," said Bethlehem-based event organizer Fahdi Tantan. "It is a basic right for them and for us Palestinians to receive our guests." Visiting Ben Gurion airport Wednesday to meet with security officials supervising preparations, Israeli Prime Minister Benjamin Netanyahu said "Every country has the right to deny entrance of provocateurs and trouble-makers into its borders. "This is how all countries behave and this is how Israel will act. We must act with determination but with minimal friction, maintain order and prevent disruption of normal life for the citizens of Israel," he said. In a statement released by the government Friday, Israeli Police Cmdr. Major Gen. Bentzi Sau said the police "operation plan has succeeded in significantly affecting the intentions of those behind the flotilla and has prevented the departure of hundreds of activists at their points of departure for Israel." Israeli security services had shared information with airlines and airports in other countries in an effort to prevent activists from being able to enter Israel in the first place, Ben Hur said. Organizers for Welcome to Palestine said that some of their activists had been prevented from boarding planes in European airports and insisted that none had the intention of causing disturbances and that the sole aim of the event was to express solidarity with the Palestinian people. In a statement, the group took strong exception with the way it had been portrayed by Israeli government officials and media. "The propaganda efforts to paint human rights advocates as 'hooligans' and even 'violent' (an attempt to demonize and dehumanize them in order to justify violence against them) is simply not credible and indeed ridiculous." About 50 would-be passengers who had been denied boarding on Israel-bound flights staged a daylong sit-in at Roissy Charles de Gaulle airport on Friday, according to French national police. The sit-in ended about 4:00 p.m., according to police. Nicolas Shahshahani, the spokesman for the group's French wing, said the decision to deny boarding to members in Paris was illegal. "We do not have the right to prevent people from having a normal economic activity on the grounds of political or ethnic background," he said. The latest developments come in wake of recent failed attempts to jump start a second naval flotilla to the coasts of Gaza aimed to protest against Israel's naval blocked of the Hamas ruled Palestinian territory. Heavy diplomatic pressure applied by Israel and the Greek government's refusal to allow Gaza bound boats to leave the port have so far prevented the flotilla from setting sail. In May of 2010, the Mavi Marmara -- owned by the Turkish Humanitarian Relief Foundation, or IHH -- and five other ships were on their way to Gaza laden with humanitarian aid and about 700 activists from various countries when the Israeli soldiers boarded it. In clashes with Israeli navy commandos, nine people were killed. CNN';s Dheepthi Namasivayam, Catherine Clifford and Saskya Vandoorne contributed to this report.